The Bissell ReadyClean Carpet Cleaner 40N7 is a best-selling and very popular small, lightweight carpet cleaner. Weighing just 12 pounds, it’s a full-fledged upright cleaner machine that shampoos and deep cleans carpets without the heavy weight. Obviously, one would not expect it’s performance to match Bissell’s better equipped and more pricey standard-grade machines, but it has it’s unique purpose. The Bissell Ready Clean 40N7 is perfect for fast and quick cleaning of spills, stains and unexpected pet messes. This machine is also a nice fit for general carpet cleaning and maintenance in small homes or studio apartments. In our review, we’re going to look at everything you need to know about this carpet cleaner, including anything you might need to watch out for before buying it. Most of Bissell’s regular-grade upright home carpet cleaners weigh well over 25 pounds, which is exactly why a lightweight carpet shampooer like the ReadyClean 40N7 (12 lbs) is so popular. The lightweight makes it easy to carry this carpet cleaner up and down stairs and to any other corner of your house without breaking a sweat. Pushing a 12 pound carpet cleaning machine around is a whole lot easier on your arms and legs than pushing a 25 pound carpet cleaner around instead. 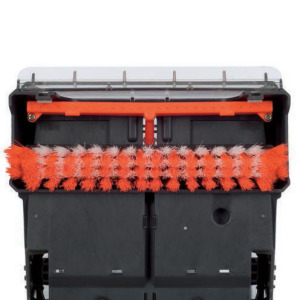 The 6 rows of brushes in this cleaner have one goal – find the dirt in your rugs and carpets and then root it out. The brush system is stationery and does not use a belt for rotational scrubbing. This advantage is that there are less moving parts to add to the weight of the machine, and to potentially break and replace. The disadvantage is that the scrubbing is purely dependent on the manual action of the user, so it may not agitate and loosen dirt from the carpet as much. You can focus your cleaning efforts where they matter most by simply pulling the spray trigger to add water and cleaning solution to your carpet. Then simply release the trigger and pass the ReadyClean 40N7 back over the same area to remove the excess water and dirt. The trigger-based cleaning system makes the tiresome chore of scrubbing your carpets clean almost fun. This carpet cleaner has a 1/2 gallon water storage tank, to which you add hot water (up to 140°F, not boiling) and cleaning solution. The dirty water sucked up by this carpet shampooer is stored in a separate tank for easy disposal. You don’t need to worry about messy 2-in-1 “bladder” style tanks or dirty water contaminating your clean water. The smaller 1/2 gallon tank compared to the usual gallon tank size of regular-grade machines also means less weight being carried around. You probably won’t need to use your carpet cleaner on a daily basis, so being able to store it away when you’re done will be appealing to most people. The retractable handle on this Bissell carpet cleaner means you can reduce the profile of the cleaner to the point where it can be easily stored under a stairs, or in a small storage closet. Bissell owners know the joy of being able to clean their carpets right up to the baseboards of any room, and the Bissell ReadyClean 40N7 is no different in this regard. The wide cleaning path allows you to clean large rooms in a relatively short timeframe, and you won’t have any edge cleaning to do afterwards either thanks to the EdgeSweep feature. This Bissell cleaner does require some assembly, but this really only amounts to two screws which hold the main body and the retractable handle components together. A single, small Phillips screwdriver is all you need to assemble the Bissell ReadyClean 40N7. 20-feet of power cord means you won’t have to swap electrical outlets very often, if at all, when deep cleaning most rooms in your home. The cleaning arc afforded by a 20-foot power cord will easily allow you to clean all but the largest of rooms in one go. The Bissell ReadyClean 40N7 comes with a 1-year limited warranty, but because it’s a Bissell you know the warranty will be honored should you ever actually need it in the first place. One of the most attractive features of this carpet cleaner is that it weighs so little when compared to its larger counterparts. If you have a multi-storey home you’ll be glad to be using a carpet shampooer which weighs as little as possible, especially when you’re trying to clean a carpeted stairs, or simply when you’re lugging it up and down between floors. It so small and portable that many users can carry it with one hand without much trouble. It’s worth remembering that this since Bissell is small and lightweight, there is a tradeoff in terms of lesser carpet cleaning capabilities. Although it does perform very well for its size, it’s designed more for rug and carpet maintenance, and cleaning out spots and stains soon after appear, rather than renovating carpets which have several years of filth and grime worn into them. The cleaning path width is around 8 inches, which offers a lot more coverage than standard portable cleaners. However, it is not suited for deep cleaning large areas. For cleaning bigger areas and homes, it will much more effective and efficient to go with regular or commercial-grade carpet cleaning machines, such as the ones listed on the homepage. When you look at what a carpet cleaner which costs less than $100 might be capable of, you’re probably preparing yourself to be somewhat disappointed. The Bissell ReadyClean 40N7 never disappoints though, and is more than capable of dealing with liquid spills, pet “accidents”, and just the normal domestic maintenance required to keep your rugs and carpets looking like new. You’ll find that this lightweight and portable carpet cleaner is a breeze to use from the moment you put it together, right through to when you start using it to give your rugs and carpets a new lease of life. When you’re through using it, you can empty the dirty water container, retract the handle from its regular fixed position, and then simply store it away until you need it again. 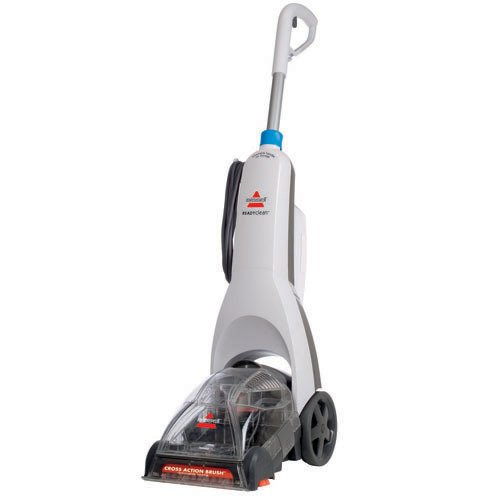 Shoppers most frequently compare this to it’s deep blue colored counterpart – the Bissell ReadyClean 47B2. Both machines have the almost the same small size and light build, with this model (40N7) being slightly lighter. This could be a result of the 40N7 being fitted with a simpler brushing system, so there are less moving parts. As described earlier, the Ready Clean 40N7 uses a stationery Cross Action brush system that relies on the user’s manual pushing and pulling to scrub carpets. The Ready Clean 47B2 uses a rotational DirtLifter brushroll, which is tied to a belt and motor. Although the cleaning results from the two machines are very similar, some users feel that the Ready Clean 47B2’s rotational brushing system is more valuable and worth the small price difference. However, the simpler brushing technology of the Ready Clean 40N7 also mean that there is less potential for machine malfunctions. Compared to the Hoover Power Path Deluxe Carpet Washer FH50951, the Bissell ReadyClean 40N7 looks smaller, weighs a little less, and has a smaller tank size. The Hoover Power Path has a much more powerful motor and wider cleaning path, and could be relied on as the sole carpet cleaner unit for a small home. It’s a lightweight cleaner that almost straddles into the world of regular-grade machines in terms of capabilities. In real life, the Hoover Power Path does not seem to have garnered the same level of consumer enthusiasm as the Bissell ReadyClean 40N7. 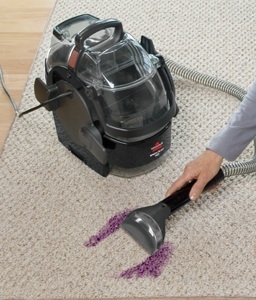 It’s also costs just as much as the better rated Hoover SteamVac with Clean Surge. For someone looking for a small lightweight upright cleaner, the Bissell ReadyClean 40N7 appears to fit the bill better and more likely to please the end-user. If you want to get the best possible results from your Bissell ReadyClean 40N7, consider rinsing the nozzle (it’s removable) after each use of the cleaner itself. With each cleaning, debris builds up, especially if there is a lot of pet hair lying around. The suction power will weaken as a result, meaning that less dirty water gets sucked back into the machine. This maintenance step gives users a chance to remove pet hair, lint or anything else which might block their future cleaning efforts. Basic maintenance like this can go a long way. As you might already expect, Bissell recommends only using cleaning solutions manufactured by themselves in their carpet cleaners. According to Bissell, using non-Bissell formulas could potentially harm the machine, and will invalidate the warranty. Sure other users have used non-Bissell detergent with success. That said, unless you are confident of what you are doing, it’s just best and really more convenient to go with Bissell’s formulas. Bissell cleaning solutions have proven to produce awesome results, so users can save time with experimentations. The two solutions often purchased alongside the Bissell Ready Clean 40N7 are Bissell OXYgen BOOST Portable Machine Formula and Bissell 2X Pet Stain & Odor Portable Machine Formula. Should You Buy The Bissell Ready Clean Carpet Cleaner 40N7? If you need a lightweight, easy-to-handle and affordable carpet cleaner, the Bissell Ready Clean Carpet Cleaner 40N7 is a great little machine that fits the bill. The carpet cleaner is perfect for easy, frequent clean-ups of everyday spills and pet messes when they develop, before the stains have a lot of time to set-in. It is also great for maintaining general carpet cleanliness in a small home or apartment, in between more intense cleanings from a more powerful machine. Not sure which carpet cleaner to buy? If you like small upright cleaners like the Bissell Ready Clean 40N7, there are additional listings in the Lightweight Carpet Cleaners Reviews section. For smaller spot cleaners, check out this list here. For general home cleaning, look through the list here.